Still here, and still yet to suffer from turista despite eating all kinds of street food and drinking all kinds of iced, juice-based goodness from random street vendors. Clearly, I´m pushing my luck, we´ll see how that turns out soon enough. I had a fantastic day today, despite not being able to drag myself out of bed before 10.30am, despite having been in bed before midnight, and despite all kinds of noise in the room that morning as various guests moved in and out. The crowd here is really fun and international, which I suppose is normal for a youth hostel, although I´ve never actually experienced the real thing before, i guess. I´m getting by with communicating in a weird hodgepodge of English and pidgin Spanish cobbled together from French, Italian and even Portuguese. The funniest experience was trying to communicate with the German guy in the same 12-bed dorm who speaks passable Spanish and very little English. In the end the Dutch girl who speaks some Spanish and a little more English had to translate. Today, I made it to the Templo Mayor, the Palacio National, and to the floating gardens at Xochimilco. A very lovely day which ended with another free concert, this time at the zocalo (I say another concert because last night I saw a couple of other free performances). More details and pictures at some point when I get back to campus. Right now it´s time to head to bed. Tomorrow morning, a long bus ride to Oaxaca City. I´m so happy to be here. PS: Even though Alan (and Ari) will probably be offended, in agreement with Terence I must say that Mexico City really does remind me of New York City. Except there´s a much better subway system here. Cleaner, much more frequent, not stinky, and at 2 pesos (US$0.20) a ride anywhere, much cheaper too (take that MBTA fare hikes!!). PPS: It´s interesting to be travelling again, the first major trip since the summer travel-ganza. Everywhere is both the same (in shade and texture, if not the exact hue)–particularly in the way I react to them (picking up the vocabulary, forming expectations, mentally settling down) but also so different and wonderfully so. Mexico is just bursting at the seams with culture and history, literally. Witness the Diego Rivera murals (Montezuma, Cortés, Trotsky, and Kahlo all in one massive mural series!) in the national palace next door to the excavated ruins of the central Aztec temple. This is in the same league as Istanbul or Rome in terms of the sheer density and scope of the cultural and historical offerings. I´m here! At the free Internet area of the actually surprisingly wonderful (thus far) Hostel Amigo. They even offer free pick up from the airport, which saves a nice $20. And saving money is really a good thing right now, because I somehow managed to lose track of the envelope containing all the USD cash I had withdrawn for the trip. Horrifying. I cannot imagine where it is or how it vanished. I refuse to be overly saddened though, given that there´s nothing I can do about it now. So I´m heading out while there´s still light to see the historic zocalo (square/plaza) nearby. PS: The “DF” stands for federal district, i.e., the metropolitan area. Everything has come together very nicely indeed, thank God. I leave tomorrow morning for Mexico City (via Houston, Texas) and I’ll be flying back late at night next Tuesday. Today was spent hurrying through the many errands that inevitably arise before a trip. 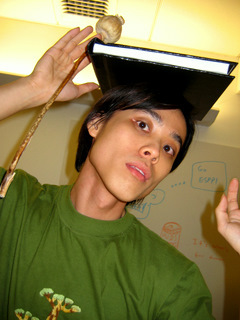 I got a new prescription for Cipro (I used up my stash on World Tour). I printed out my boarding passes. I got a haircut. I’m not sure how I’m going to write the two essays due immediately after I get back, but I’ll think of something. My happy story for the day happened right after my haircut near the Prudential Center. As background, since last night I’d been looking around for an inexpensive travel guidebook to Mexico City. Naturally, all the copies in the Harvard library system had been checked out, presumably by other students on break. (Don’t even get me started on trying to find a Spanish phrase book in the system – that’s a story for Ryan!) So this evening, after managing to catch the stylist at his only open appointment for today (Kent squeezed me in while the guy before me was waiting for his highlights to set), I wandered over to the Barnes and Noble at the Prudential Center mall and browsed through the travel guide section. As expected, I was loathe to pay the $30 (including tax) for a shiny new Fodor’s or Frommer’s that I would only use for a week. 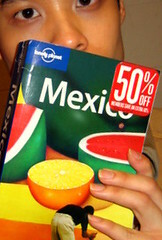 But then lo and behold, when I reached up and pulled down a random copy of the guide book I really wanted–the latest Lonely Planet Mexico–I found it marked with a “50% Off” sticker! Turns out that one copy was discounted on account of being “damaged”, i.e., the spine was a little creased as you can see in the picture below (maybe it was dropped in the stock room). Looks good to me! And I’m sure it’ll look much more damaged when I get back in a week. Today I woke up feeling incredibly wobbly and with a steady headache, and found my room completely trashed. Very collegiate, no? Except this wasn’t a hangover of the partying sort. This was the thesis hangover. After a week of not really sleeping, two weeks of not really eating, and a month of not really relaxing, it’s really no wonder that I slept for 17 hours straight and woke up feeling only partly revived. I weighed myself this morning and was pretty shocked to see how much weight I’ve lost recently, which only confirms what I recognise (unprecedented for me) to be a thesis-induced skeletal look. Very runway 🙂 I think my complexion for the past week would be best described as “death-mask”. Wed 3am-6pm: four Ferrero Rocher chocolates. Endless litres of water. Jelly beans. Wed 6pm-9pm: dried figs, rabbit paté on crackers, and some hard cheese. Nausea. Thu 3am-8am: nothing. Many litres of water. Thu 8am-10am: chocolate butter croissant, iced lemon tea. More nausea. 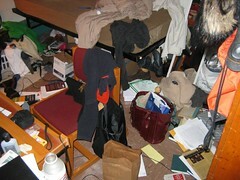 Which reminds me, I should get back to tidying. So many things I wanted to say. So in case you didn’t catch the unfortunate phrasing, Summers seems to have said that education for girls and young women in developing countries can be justified simply as a means of “averting births”. Which of course might sound a little indelicate to the non-economist. What I particularly liked in the above excerpt was the citing authors’ careful note that Summers’ background paper did not necessarily represent the views of the World Bank or its member countries. 24 hours to go, and 18 hours of work left. It’s coming down to the wire for me, although overall I think I’ve adequately adjusted to living under seige. Food, friends, fun… I’m finding these are all things you can do without, if necessary. Breathtaking, no? To read all three essays on Rational Choice Theory and Welfare Analysis which comprise Ole J. Røgeberg’s 2004 doctoral dissertation in Economics at the University of Oslo, click here (pdf file will open in new window).